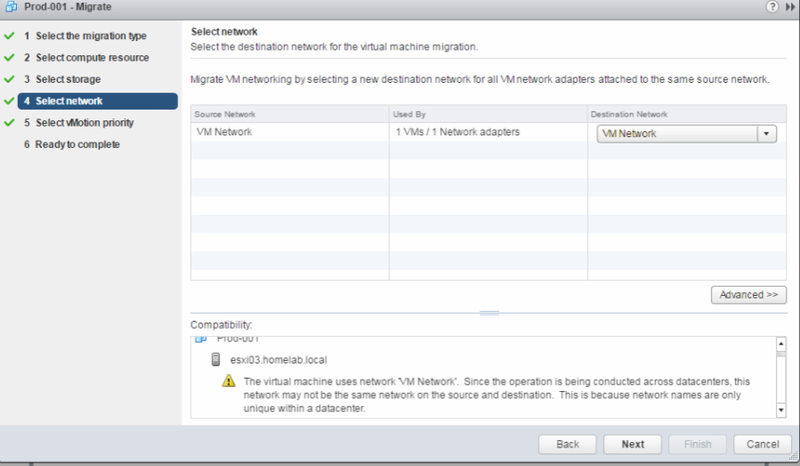 Last night while playing with my Home Lab I live Migrated one of the Virtual Machine from one vCenter to another vCenter Server. 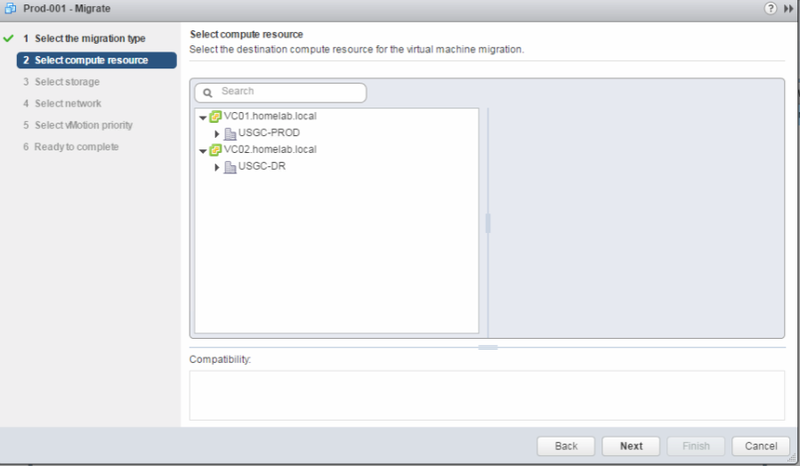 The VM which i planned to migrate is Prod 001 and is currently running on ESXi01 in USGC-Prod on VC01.homelab.local and I would be migrating the same to VC02.homelab.local under USGC -DR datacenter on ESXi04. 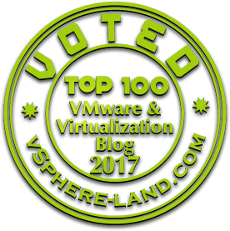 Before we being it's really important to understand some of the prerequisites to ensure vMotion to work successfully across vCenter Server. The source and destination vCenter Server instances and ESXi hosts must be running version 6.0 or later. The cross vCenter Server vMotion features require an Enterprise Plus license. 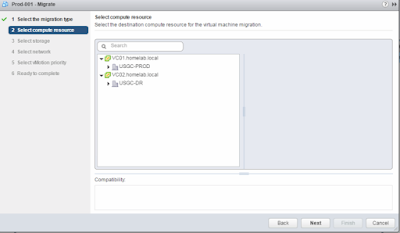 When using the vSphere Web Client, both vCenter Server instances must be in Linked Mode and must be in the same vCenter Single Sign-On domain so that the source vCenter Server can authenticate to the destination vCenter Server. 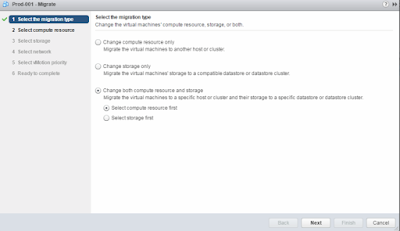 Both vCenter Server instances must be time-synchronized with each other for correct vCenter Single Sign-On token verification. 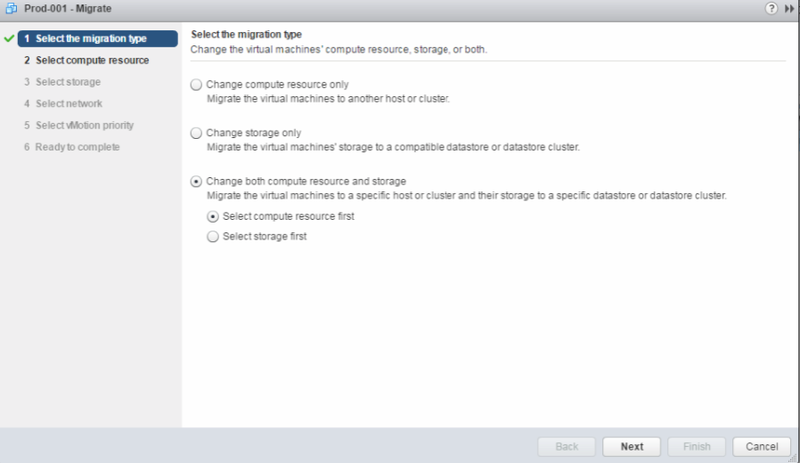 Now that we have seen the prerequisites it's time to initiate vMotion across vCenter Servers and see what are the results. 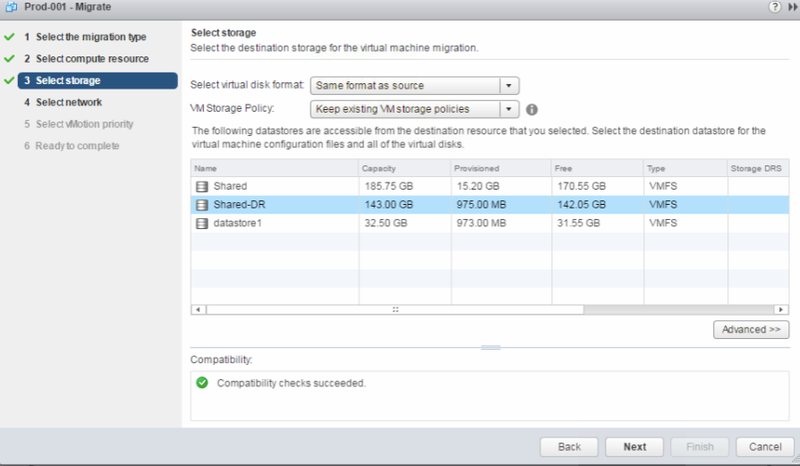 When proceeding further with the Migration i selected to change both the Storage and Compute because In My Home lab Environment i already have shared datastore created in both the Prod Site and DR Site named as Shared and Shared DR.
And also i got couple of ESXi running in my second vCenter Server on which i planned to migrate the Virtual Machine. When Selecting the network as you can see that there is a warning which appears in the compatibility section which talks about the Network Name not being Unique as the operation is performed across datacenter so will proceed further and ignore this warning. 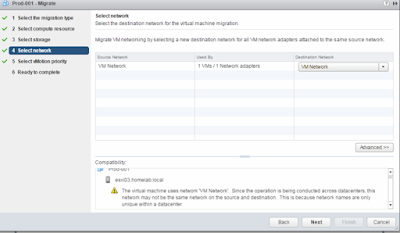 Below are some of the events captured during the vMotion Migration it took it's own time but i was happy to see my Virtual Machine being Migrated to another vCenter Server running in my Home Lab Environment. *Note: Installation/Configurations/Specifications methods used here has been Tested in My Home Lab Nested Environment .